Where to Buy PT Pro Control Plus, BASF Pro Control Plus TR Fogger Insecticide Aerosol - 6 oz - $11.25 for Sale with Fast Free Shipping! 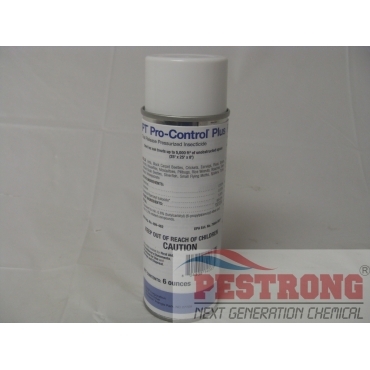 BASF Pro Control Plus TR Fogger Insecticide Aerosol - 6 oz combines botanical pyrethrin with cyfluthrin for quick knockdown with long lasting results. Pylon TR Total Release Fogger Insecticide -..
Use on Non-food/feed areas are areas such as garbage rooms, lavatories, floor drains (to sewers), entries and vestibules, offices, locker rooms, machine rooms, boiler rooms, garages, closets, and storage(after canning or bottling). I had two insect problems at my house, a wasp nest and roaches, so I went and applied this spray on wasp nest and that was end of that! and it did a fine job on the roaches as well, I have to say I am greatly satisfied with the purchase.